I don’t know about you, but I’m waking up a lot earlier since the weather has been so warm and we are leaving curtains and blinds open in an attempt to get some air in our bedrooms! I usually wake refreshed to the sound of birdsong outside the window and look forward to a lovely Summer’s day! Sadly, I know not everyone will wake up today having had a peaceful night’s sleep. Insomnia and sleeplessness are scarily common conditions these days, posing potential risks to mental and physical health. In fact two thirds of UK adults suffer from disrupted sleep and nearly a quarter manage no more than five hours a night*. 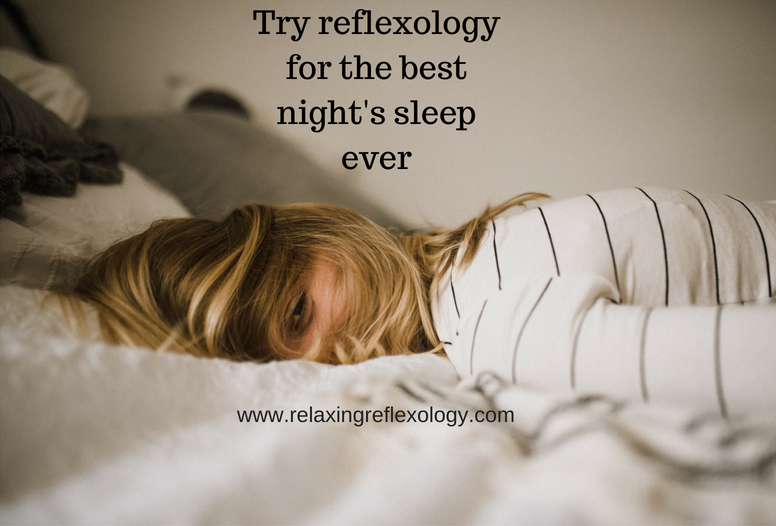 As a reflexologist, I treat several clients who have difficulty sleeping. Some of them struggle to fall asleep; others can drift off but cannot stay asleep, waking frequently during the night. This is insomnia. And when you wake during the night all your problems and worries can feel ten times bigger. When you don’t have enough sleep you can become irritable, grumpy and low on energy, perhaps dependent on caffeine. Tiredness makes driving dangerous and you might find it hard to concentrate on your work. Do you remember the classic episode of Friends where Chandler falls asleep in his meeting and unknowingly agrees to go and work in Tulsa? The health benefits of reflexology are wide-ranging and vary by client. However, a peaceful and serene night’s sleep is probably the most common. Even after their first treatment most clients achieve a restful, quality night’s sleep. Treatment generally relaxes muscles throughout the whole body and helps your brain to switch off. If stress is the root cause of your insomnia, reflexology is also proven to reduce cortisol levels (the stress hormone) and reduce anxiety . There are various pressure points in the foot that I will focus on to promote better sleep. This really depends what you believe the source of your insomnia or sleeplessness to be. Brain – focusing here helps to relieve mental stress, worry and fear. Solar plexus – massaging this area can calm your breathing and also reduce anxiety. Circulatory systems – if your sleep problems are caused by restless legs syndrome, massaging this area can help to relieve symptoms. Stomach – can reduce discomfort caused by problems in the gut that may prevent you catching a natural sleep. By exploring different areas of the foot your reflexologist might discover areas of tenderness, pain or muscular tension. If you’re unsure what’s causing your sleeping disorder this exploration could get to the root of your problem.